The ALLPRO 2010® is the next generation of film processors from ALLPRO Imaging. 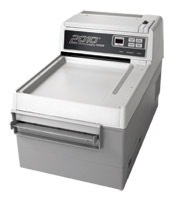 Like its predecessor, the 2000M, the ALLPRO 2010 consistently delivers high quality 8"x10" and 10"x12" x-rays quickly and automatically. The ALLPRO 2010's microprocessor takes the guesswork out of film processing by accurately controlling time, temperature and chemistry strength, the keys to consistent film quality. Two user-selectable speeds allow the processing of all types of x-ray films. The efficient warm air dryer ensures that films are delivered completely dry to allow immediate reading and diagnosis.